Posted on Sun 22 Nov 2009 at 5:28 PM PST. Filed under Hardware. Geeks.com, sent over the consumer Kodak M420 digicam for a quick look. This is a 10 megapixels camera, shooting at a 3648Ã—2736 resolution. It features a sensor of 1/2.3-inch CCD, a 3.0-inch wide angle color LCD display, a 4x optical zoom, digital image stabilization, 64 MB internal memory, SDHC slot, face detection, high ISO support up to 6400, text and sound tags, records continuous VGA video (640×480) at 30 fps and QVGA video (320 x 240) at 30 fps (MJPEG), and it comes with many scene modes. According to the specifications it has a Schneider-Kreuznach Variogon lens, 28 – 112 mm (35 mm equiv. ), f/2.6 – 5.8, shutter speed of 8-1/1000 sec., auto focus modes at normal, macro, infinity selectable, white balance with auto, daylight, tungsten, fluorescent, open shade options, a flash range of 0.2 – 4.0m at wide, ISO 400; 0.5 – 1.8 m at tele, ISO 400. Flash modes: auto, fill, red eye reduction, off, burst modes: self-timer (2 sec/10sec, 2 shots), burst 3 shots, scene modes: portrait, sport, landscape, close-up, night portrait, night landscape, snow, beach, text/document, fireworks, flower, museum/manner, self-portrait, high-ISO, children, backlight, panning, candlelight, sunset, panorama (right-left), panorama (left-right), blur reduction, program. There’s also AV output with NTSC/PAL selectable support. The package came with a wall charger, which is pretty rare for Kodak cameras. Charging the battery for the first time took a whopping 7 hours. Battery life was so-so with this camera, mostly because of the large screen it had to power up. On paper this camera’s abilities look good, but the quality we got out of it was sub-par. As you can see from the sample pictures, there’s fringing, and a very grainy look — reminiscent of interpolated cams. We also found it impossible to focus close enough in our macro shooting experiments. More over, the camera over-exposes like crazy in auto mode. The only good thing about its actual shooting abilities is the wide-angle aspect of the lens. The ergonomics for the camera are not good either. I usually don’t complain about ergonomics on digicams, but this one is worse than usual. The flash/on-off/shutter buttons are glued next to each other, and more often than not I kept clicking the wrong button. The trash/menu/info buttons are very small and round, and so I needed to use my fingernail to press them — using just the thumb would press the wrong button. The D-pad’s round and stiff nature is as problematic too. Only good thing about the ergonomics was the zoom rocker buttom, which in fact I found it better than in most other digicams. The video mode is very basic (30 fps VGA MJPEG .mov) and there are no manual controls for it. In fact, the only manual control that the camera has is in its “P” mode, where there’s exposure compensation. When manually reducing exposure we were able to shoot a few acceptable pictures that weren’t hopelessly over-exposed. Overall, I don’t think most people would be happy with this cam. Even every day people who just snap random pictures and don’t care about controls won’t be very happy with it. The pictures produced are too grainy, and the cam over-exposes way too much. 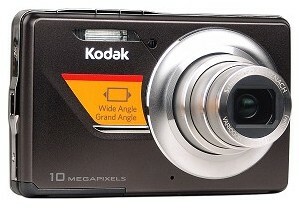 If you need a cheap digicam I would suggest the Kodak Z1285 instead, which shoots better pics, has good manual controls when needed, has 720p HD video recording support, and it’s much cheaper too!